Tournament Parser allows you to download your tournament information and post rail summaries to online poker forums with the click of a mouse. Whether you wish to publish your daily session results or your last 1,000 tournaments, you can do so with ease thanks to Tournament Parser. Once the initial setup has been completed, you can fetch hand histories and then copy and paste that information into Tournament Parser so it can be analyzed. Enter your starting bankroll and other factors that will be published in the rail (you can customize filters by buy-in, date, game type, etc.) and then click on the “Generate Rail” tab to begin. Tournament Parser will automatically calculate the statistics, including buy-ins and total profit or loss. 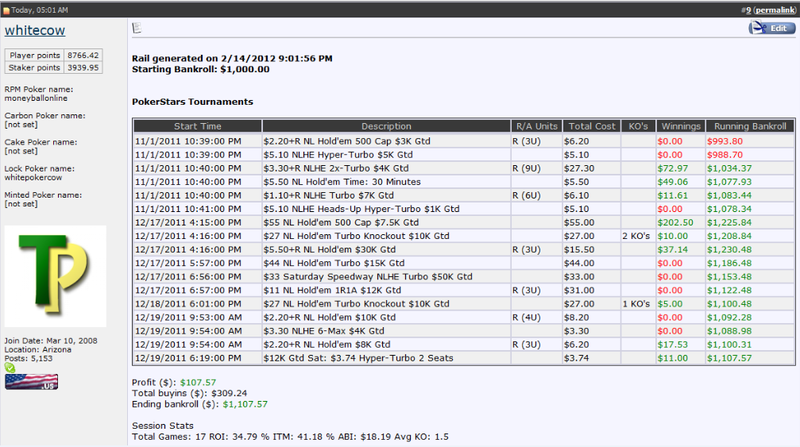 Once you have your rail ready, you can go to PartTimePoker and post it for free with the click of the mouse. This program is especially useful for online poker players who want to have a detailed record of their overall profit-based statistics. The tournament information is "parsed" quickly and the posts are easily readable once they’re transferred to PartTimePoker. Bustout hands are the first hand histories that get displayed when opening Tournament Parser. This allows players to scroll directly to hands that may be of question or require further analysis. The TournamentParser.com website features a "PushPot" tab that calculates Independent Chip Modeling (ICM) situations for players who wish to study scenarios that come up deep in tournaments and sit and gos. Payment plans include a one-month subscription for $5, a six-month subscription for $20, a one-year subscription for $40, and a two-year subscription for $60. The program is simple to use and requires very little configuration. Being able to automatically post your online poker rail summary to the forums is a huge time-saver that will allow players to focus on actual poker play and analysis. For those who would like to try out the application beforehand, Tournament Parser comes with a free, no-obligation 10-day trial. Tournament Parser currently supports PokerStars, the iPoker Network, the Merge Gaming Network, Full Tilt Poker, and PartyPoker. You can also enter tournaments manually. Stakers who wish to buy a bulk package of Tournament Parser licenses can contact support@tournamentparser.com for more information and preferred rates depending on the number of licenses needed. To find out more about Tournament Parser and to begin using this program, visit TournamentParser.com.